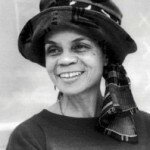 September 9, 1934 Wilsonia Benita Driver (Sonia Sanchez), poet and playwright, was born in Birmingham, Alabama. In 1943, Sanchez moved to Harlem, New York to live with her father. In 1955, she earned a Bachelor of Art degree in Political Science from Hunter College. Later she completed postgraduate work at New York University. Sanchez has authored over a dozen books of poetry, including “Love Poems” (1973), “Homegirls and Handgrenades” (1985), and “Does Your House Have Lions” (1997), and six plays, including “The Bronx is Next” (1970) and “I’m Black When I’m Singing, I’m Blue when I Ain’t” (1982). She has also edited two anthologies on Black literature, “We Be Word Sorcerers: 25 Stories by Black Americans” and “360 Degrees of Blackness Coming at You”. Sanchez has taught at eight universities and has lectured at over 500 college campuses. She was the first Presidential Fellow at Temple University where she began working in 1977, where she held the Laura Carnell chair until her retirement in 1999. She is currently a poet-in-residence at Temple. In 1969, she was awarded the P. E. N. Writing Award. She also won the National Academy and Arts Award and the National Endowment for the Arts Fellowship Award in 1978-1979. ← September 9th in African American History – Otis Ray Redding, Jr.